April 12, 2019 - We are very grateful to for the new windows that were installed at our Coleman Street home for individuals with developmental disabilities this week. The new windows replaced the 30-year-old windows that were well past their prime. The $34,000 cost was covered by our donors, including a GVCSS Board Director, family members of an individual living at the house, and a private foundation. We'd like to give a very big thank you to our generous supporters for making this much-needed repair project come to completion. The individuals and staff are very happy in their warm home! April 5, 2019 - Congratulations to Maria Moeller, GVCSS' Director of Home Care, on her election to SafeCareBC's Board of Directors and appointment as Vice-Chair. Maria continues to influence safety in healthcare with her leadership and expertise in this area. 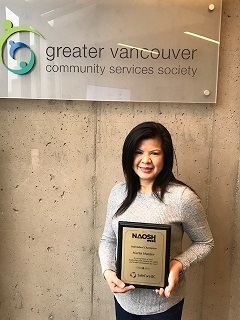 In February 2019, Maria received North America Occupational Safety and Health Week's Individual Champion award in recognition of her leadership and passion for safety and health throughout the year. Dance to live music and feast on award-winning BBQ - all for a good cause! Mark your calendars for our annual Harvest for Homes event on September 21 benefitting our Community Living homes on the North Shore. Tickets will go on sale this May. Sign up for our newsletter or email Laura Johnson for more information. For more information about our fundraising activities and goals, please contact Fund Development and Communications Officer Laura Johnson (phone 778.877.5304). We also invite you to learn more here.